Perennial; caespitose. Stolons present. Culms erect; 10-30 cm long. Culm-nodes bearded. Ligule an eciliate membrane; 0.5-1 mm long; lacerate. Leaf-blades 3-20 cm long; 1-4 mm wide. Leaf-blade apex filiform. Inflorescence composed of racemes. 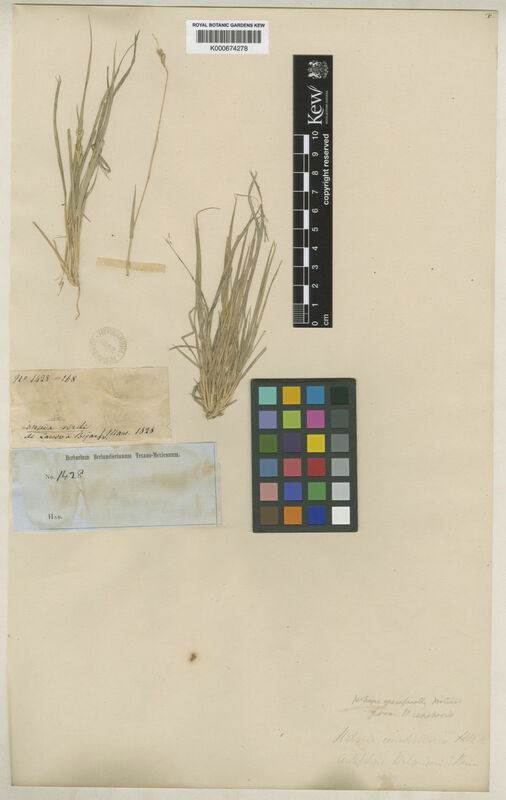 Racemes 4-8; borne along a central axis; closely spaced; in a multilateral false spike; oblong; unilateral; 0.5-0.6 cm long; bearing a triad of spikelets. Central inflorescence axis 2-3.5 cm long; flattened. Rhachis obsolete; deciduous from axis. Spikelets in threes. Fertile spikelets sessile; 1 in the cluster. Companion sterile spikelets sessile; 2 in the cluster. Companion sterile spikelets well-developed; male; flabellate; dorsally compressed; 4.5-6 mm long; longer than fertile; deciduous with the fertile. Companion sterile spikelet glumes united below; coriaceous (pallid with purple spots); 7 -veined; scabrous; glabrous; lobed (asymmetrically bilobed); truncate; awned; both glumes awned; with 1-3 mm long awn. Companion sterile spikelet lemmas 2; exserted from glumes; muticous. Spikelets comprising 1 fertile florets; without rhachilla extension. Spikelets oblong; laterally compressed; compressed strongly; 4.5-6 mm long; falling entire; deciduous with accessory branch structures. Companion sterile spikelets well-developed; male; flabellate; dorsally compressed; 4.5-6 mm long; longer than fertile; deciduous with the fertile. Companion sterile spikelet glumes united below; coriaceous (pallid with purple spots); 7 -veined; scabrous; glabrous; lobed (asymmetrically bilobed); truncate; awned; both glumes awned; with 1-3 mm long awn. Companion sterile spikelet lemmas 2; exserted from glumes; muticous. Spikelets comprising 1 fertile florets; without rhachilla extension. 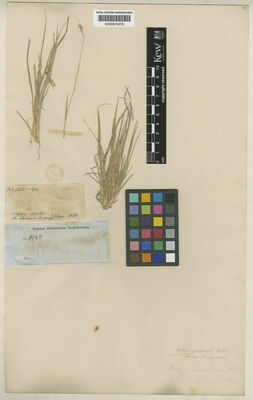 Spikelets oblong; laterally compressed; compressed strongly; 4.5-6 mm long; falling entire; deciduous with accessory branch structures. Glumes connate along margins below; similar; shorter than spikelet; firmer than fertile lemma. Lower glume oblong; 1.5 mm long; 0.5 length of upper glume; coriaceous; 1-keeled; 7 -veined. Lower glume apex lobed; 2 -fid; awned; 1 -awned. Lower glume awn 1-3 mm long. Upper glume oblong; 3.5 mm long; 0.6-0.8 length of adjacent fertile lemma; coriaceous; 1-keeled; 7 -veined. Upper glume apex lobed; 2 -fid; awned; 1 -awned. Upper glume awn 2-5 mm long. Fertile lemma ovate; laterally compressed; 4.5-6 mm long; cartilaginous; keeled; 3 -veined. Lemma apex caudate. Hilaria belangeri var. longifolia (Vasey ex Beal) Hitchc.